The hibernation is almost over. It’s been a long time since I’ve written anything. When we first moved here, Matt and I agreed that we’d wait a year before doing anything drastic, so I haven’t made many changes besides putting in a small rock garden with a few currant bushes and a kitchen herb garden. Oh, but that year is up and now it’s on. This house was built in 1803 by a doctor and his sons after serving in the Revolutionary War. He built it to align with the equinox, which makes one terribly conscious of how fast time goes by – now the sun is moving back across the hills, approaching the place where it lines up with my doors. In the morning when it rises, it pours so intensely through the windows that you feel a natural inclination to just walk outside in your pajamas. I’ve spent my winter studying (or rather, annoying the crap out of Matt) – permaculture design, pastured poultry, groundwater, organic pest control methods, honeybees, hard cider recipes, ways to preserve green beans, composting systems, tomato varieties, oh my word I’m such a dork. But I’m super stoked for this summers to-do list. First thing is to prepare new gardens. In order to first address my tomato obsession, we last year tilled a separate patch of ground closer to the house. This will become a little tomato wonderland, including other things commonly found with tomatoes such as garlic, basil, and a place to sit with a glass of wine and smell it all while talking with your hands. There are honeybees in the barn wall. Many of them. So the plan is to get them out of the wall and start 2 hives. One, by taking some of the bees and introducing them to a new queen which I’ve ordered; the other, by either locating the existing queen and putting her in a new hive, or relocating comb with a queen they might be raising to the second hive. This may end in painful stinging tears since the hive is in a small room, but hopefully we’ll get to them before they’re quite active. I may have to actually vlog that one. The beginnings of an orchard. There are already “antique” apples all over the place. We haven’t decided which to go with next – vote for peaches or cherries in the comments. Painting the porch, but that’s not interesting. Chickens! Yay, gotta have chickens, right? Dante has been helping me build a mobile coop a la Joel Saladin but we are going to wait to start any of that until after vacation with the fam. The plan is to begin both broilers and layers this year with the possibility of leaving the layers off until next. I’m finding it difficult to come up with a plan I like for the layers and I don’t want to rush them just to have them. 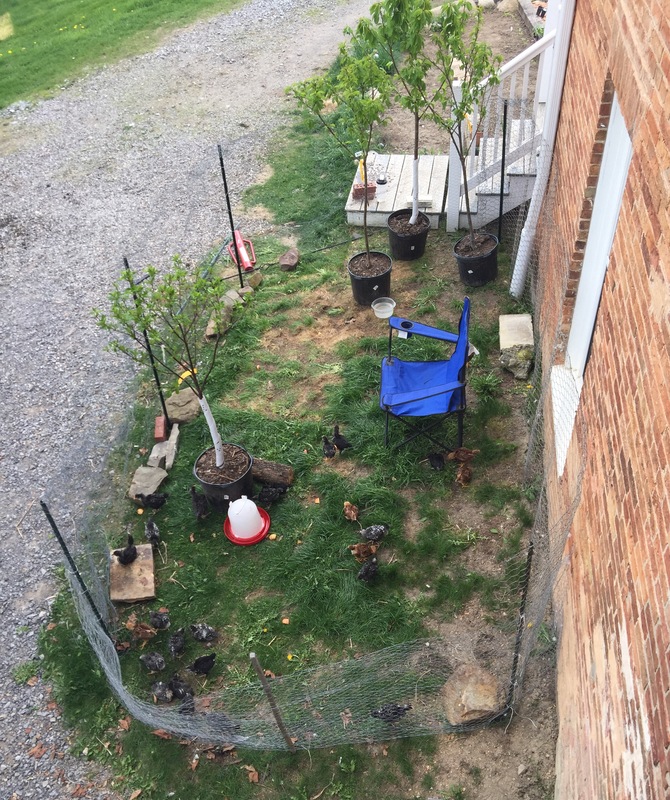 I know that the first thing most people do is get a few laying hens, which does seem less complicated. But when I crunch the numbers, for a place like this, eggs are more for the pleasure of having them than for saving any money. A project I’m expecting to be a sort of ongoing drama is my wishful irrigation/drainage system from the spring. There is sooooo much water here. Conveniently, the spring pops out at the top of the hill. I plan to direct it down to the tomato patch, then down to the chickens, then over to the gardens and past the raspberries, then away to the creek. In theory this will help reduce some of the spring sop, but still keep the water at hand if it’s dry. Challenge #1 is to create something that doesn’t make getting over it (mower, tractor, atv, electric poultry fence) terribly annoying. Eventually I’ll incorporate some rain barrels. There is a lot of run-off between the house and the barns. Currently I am ripping the overgrown brush away from an old cattle fence next to my new big garden. This will become something for raspberry bushes to lean on. It is one of the handful of projects I can do while it’s still too wet to keep the tractor from getting stuck. Whew. Those are the biggies. The seedlings are started, the beekeeping suit is here, the spring fever is in full effect.